Baku 2015 Meet The Team, Plus Full Schedule and Format Info. 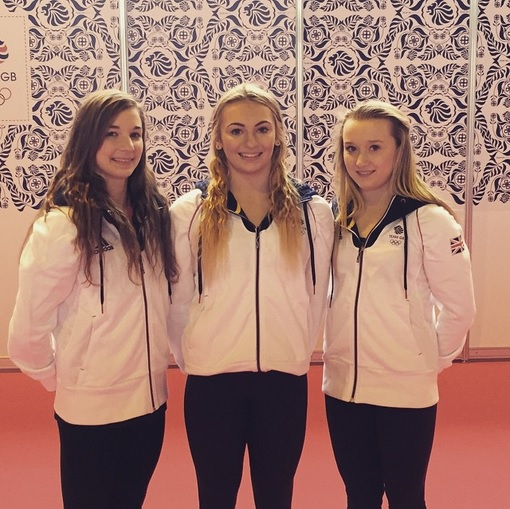 With the first European Games almost upon us, lets take a look at the British gymnasts selected to travel to Baku and represent their country. The opening ceremony for the games takes place on Friday 12th of June, with the qualifying events for gymnastics beginning on the 14th. The format for this competition is unlike any other major event (and hopefully not a sign of things to come), in that each country is represented by a team of just three gymnasts. For team competitions there will be a 3-3-2 format, the top eighteen gymnasts from qualifying will advance to the AA final, with one per country only, and the top six gymnasts from qualifying on each apparatus will advance to apparatus finals, again only one gymnast per country can qualify. Qualifying will be split over two days, with the WAG gymnasts competing vault and bars on the first day, then coming back to compete beam and floor the day after. In this respect it is similar to the format of the 2014 Commonwealth Games. 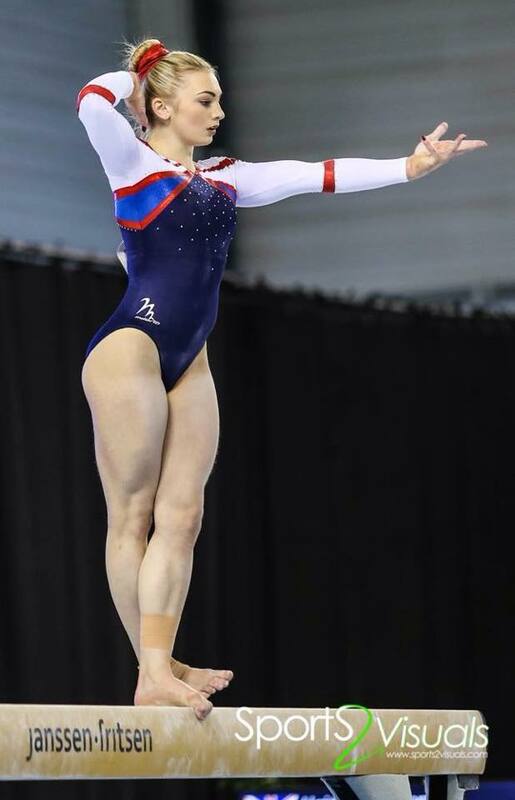 Park Wrekin, Wales, and GB second year Senior and recent 18th birthday girl Georgina Hockehull will be familiar to all those who enjoyed the Commonwealth Games in Glasgow last year. Part of the hugely successful Welsh team to take the bronze medal, Georgie was also 6th in the all around, and held her nerve fantastically in a very shaky final to take the bronze medal with this beautiful routine. It’s clear to see that Georgie really shines on beam, working smoothly and really getting the key to a strong beam work, keeping the movement flowing, and working with great lines and confidence. Georgie has upgraded on this piece this year, adding a free cartwheel layout, and linking the free walkover to the switch-switch 1/4 for a nice 0.2 bonus. Georgie’s beam work also earned her the silver medal at British championships this year, where she only competed this piece. 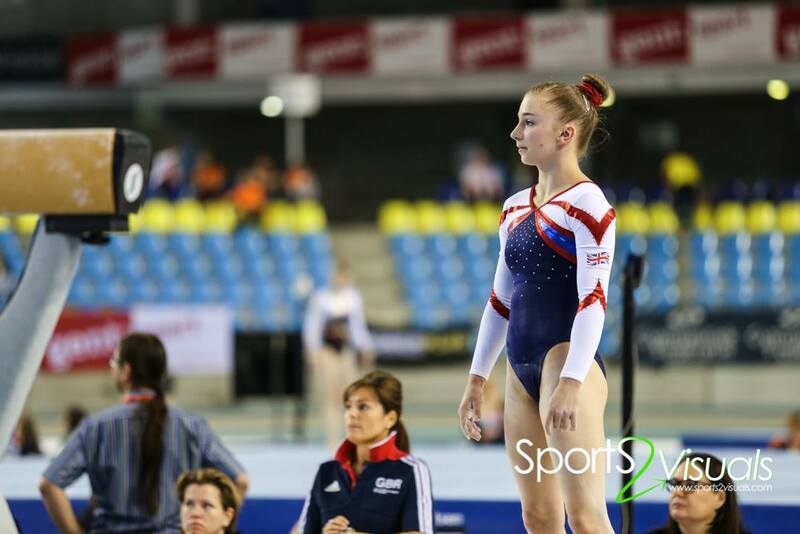 A look at Georgie’s AA work is harder from this year as she did miss the British AA in March. However she has competed AA at the WOGA classic placing 9th, and performing very well on beam placing 3rd, and on floor placing 2nd with this typically well choreographed routine which we are used to seeing from the Welsh ladies. Bars and vault I would say are Georgie’s weaker pieces, she doesn’t have a huge swing on bars as yet, and is currently working off a 5.4 D score , and averaging about a mid 13.00. For vault she has a very nicely performed FTY, with good flight and form, scoring around the mid 13’s. 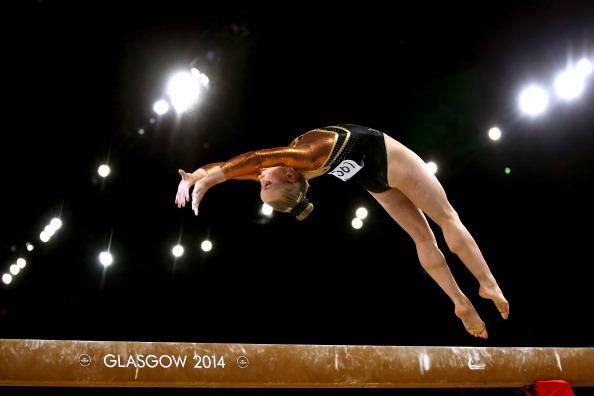 Have a look at her bars and vault performances from her fantastic efforts at the Glasgow world cup in December 2014 where she competed outstandingly to take 4th place AA. Georgie has a chance at securing a place in the beam final in Baku should she be at her best QF, fingers crossed for a great routine. Followers of British Gymnastics will have been familiar with Liverpool gymnast Charlie for some time now. A strong junior and member of the 2012 Junior European team, Charlie marked her debut senior year with a place on European team, as well as the team that traveled out to Antwerp for the world championships. At this years British Senior Championships, Charlie was 9th overall despite problems on floor and beam, she also made the bar final. Most recently Charlie competed in Ghent at the FIT challenge, and here we can see what sort of routines she will be presenting in Baku. The videos are from the FIT Challenge of the 30-31st May, so her most recent work. On vault she has a strong Yurchenko full, generating excellent height from the block, perhaps even more height than she realises, as she does change the shape a little coming down, and has no need to at all. Given how early she has the twist completed, and the height she has, there is definitely the potential for upgrade here. Unsurprisingly, as a Liverpool gymnast Charlie has a great swing on bars. Most of her difficulty is built from transitions, and she works the bars and her shape changes very well to get the most out of them. She also has a Markelov toward the end of the routine, and finishes with a very impressive double straight. For Beam there is a disappointing lack of footage to share with you, but her work is elegant, her long lines very effective when she’s hitting with great form, and she has competed a very high and impressive flick to one – flick to two – double pike dismount. On floor Charlie has a maturity to her performance, working well to her dramatic music. She twists and somersaults well, opening will a high piked full-in, including a nice whip to double tuck, and one and a half to double twist, then finishing with a good double pike. Kelly Simm is gunning for Rio, whether she makes it or not will of course depend on so many factors, but make no mistake, this is a gymnast and coaching team making a huge statement of intent. Dynamo gymnast Kelly has of course been around for a few couple of years now, she’s not a new British Gymnast by any means, places on the 2014 world championship and Commonwealth Games teams showed she had reached the top end of the senior squad, but complacency kills, and Kelly along with coaches Debbie and Keith Richardson seem determined not to get lost among the younger names coming through in the race for Olympic places. Bars is where Kelly has made the most impressive jump this year, firstly, she has competed an enormous Ray straight into Tkatchev, but then not content with that, she then upgraded her new upgrade to a piked Galante. A PIKED GALANTE as in never done before PIKED GALANTE!!!! Oh she has also added a toe on full in the last couple of months, connected the the Pak to the Ray shoot, and changed the Maloney to a Komova II for good measure. In 2014 Kelly scored mid twelves at both the English and British championships, last week she scored 14.10 with a 6.0 D score, this is what I mean about raising the D and E scores so successfully. On beam Kelly has upgraded both her dance and her acro this year, the flick-tuck from last year is now a layout, she has a C-C leap series for 0.1 bonus, and again added huge difficulty with a full in dismount. The consistency isn’t always there yet on this piece, but the performance level, execution and amplitude are all of a higher standard. The routine linked is from the English, and she doesn’t make it through without error, plus it was the first outing for the full-in which has improved since then. Sadly there isn’t a more recent vid up as yet, but I will add it if one pops up. On floor Kelly has always been known for her high level tumbling, she hasn’t always been able to perform the difficulty without error though. Again there are upgrades here, but not at the expense of performance, in fact I would say that after a couple of outings, her floor is looking better than ever. Not a natural performer, Kelly seems to have found her style, and maturity is helping with confidence in performance. Not every gymnast finds the performance side of gymnastics comes either naturally or easily, for some it is another area that requires constant work on progressing that takes many years to begin to master. The difference in the whip-fullin in just a couple of months is marked, all Kelly’s tumbles are very well executed, her leaps high, precise and with great range. There was a little lack of precision on a couple of landings in Ghent, but the routine looks comfortable for her, and very impressive. So massive upgrades, attention to improving E score, and still room for improvement in precision and consistency which will raise her scores even higher. Oh, she’s not done either. Yep, you see all those huge upgrades Kelly has made? Well there are more in the pipeline. I don’t feel it appropriate when a gymnast hasn’t competed a skill or released it on social media to name skills, as it is up to the gymnast and personal coaches, but there is even more to come. Many British fans will remember Dynamo gymnast Vanessa Hobbs climbing the ranks slowly, then surging forward through 2003 and 2004 onto the Athens Olympic team, Kelly it looking like she’s on the same trajectory. So there we have our team for Baku, British Gymnewstics will of course be covering championships extensively. Good luck ladies, may you all have your best competition! June 7, 2015 in Competition.